Apco Aviation is the biggest wing and harness manufacturer in the World with a well established reputation for quality, innovation and top of the line products. The Alex Varv/ JC Perren harness is not available anymore. We implemented some of the features of this harness into an existing product made by APCO: the universal PPG harness. 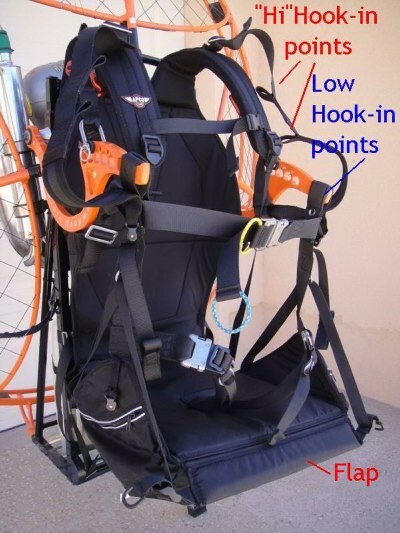 This new harness is made exclusively for Aero Cors-Air USA and will fit almost any of the existing paramotors on the market. 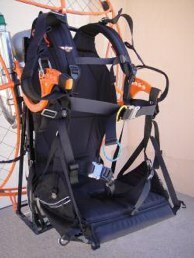 The harness was primarily developed for the Cors-Air Kangook set-up (medium low hook-in points) similar to the old AIRFER or PAP systems. 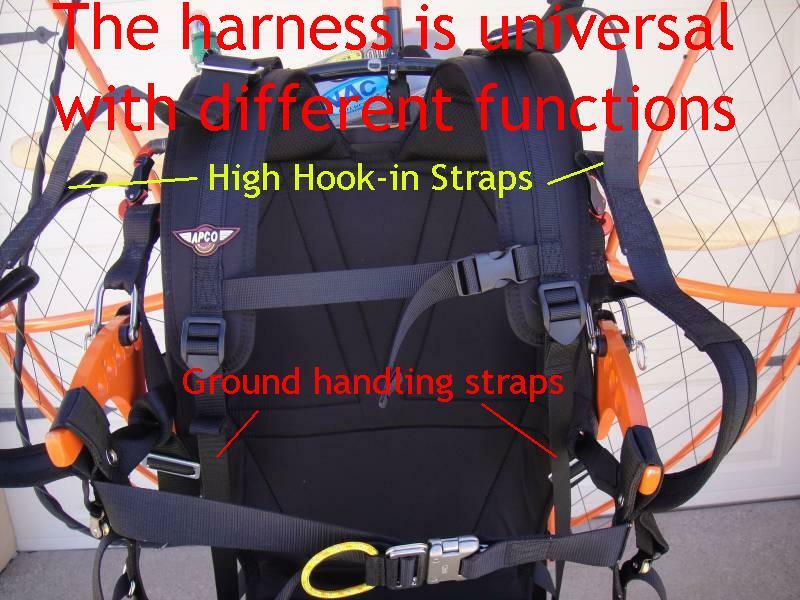 However, the new harness has also high hook-in point capabilities, ground handling straps and a few new proprietary changes. The harness can be mounted on pivotable distance bars, fixed bars and again, high or low hook-in points. Below, we will present this harness with some explanations. We strongly believe that now we can offer to the PPG community not only a universal harness that can diminish torque effect but a high quality product offered at a very competitive price. 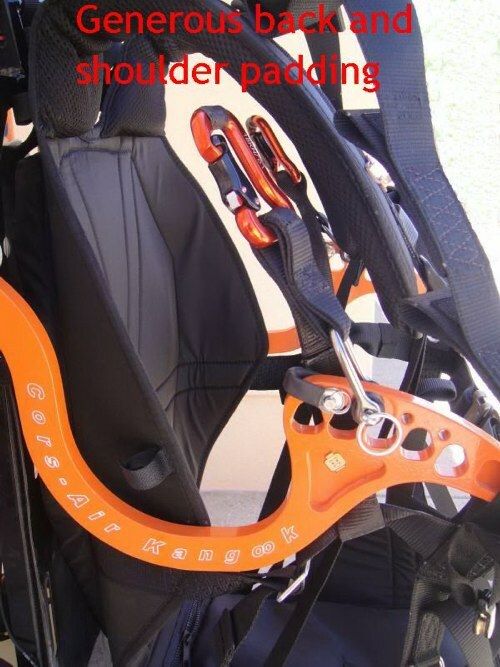 The "Flap" shown above is basically a hinged extension of the seat that is guided by two side straps and allows a very easy entry or exit from the harness. 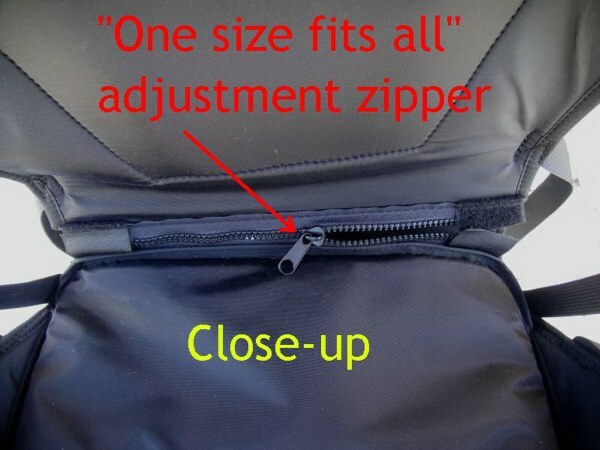 zipper system that allows to change the size of the harness. The new harness has a very generous padding on the shoulder straps and in the back that make it very comfortable. The micro netting that covers the padding allows air to circulate easily and prevents sweatting. 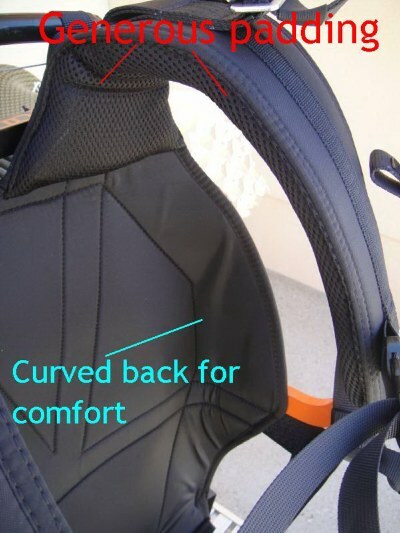 The back (vertical) part of the harness is rounded for maximum support and comfort. The back side of the harness has a generous 1,5 inch padding which will diminish engine/propeller vibrations. 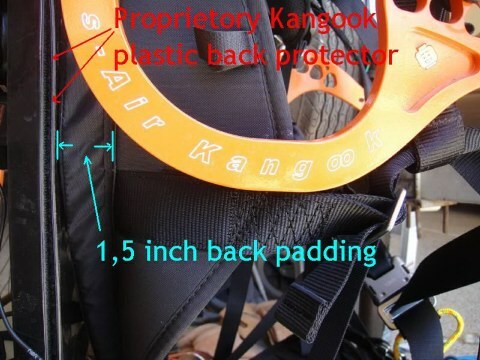 The Cors-Air Kangook paramotor has an additional plastic back plate that protects the harness and reduces wear when the harness seat tilts up or down while the pilot enters or exits the harness. 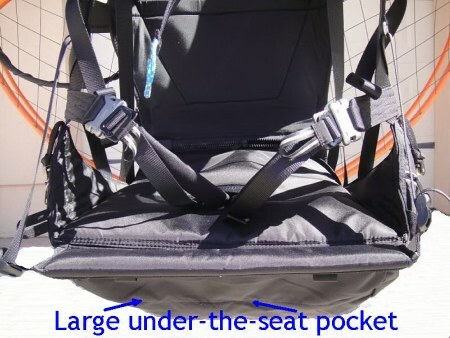 As described above, the seat has two guiding straps on each side which allow the seat to tilt up or down much easier. When properly balanced on a simulator, the pilot will automatically assume a seated position after lift-off and no hands will be needed to get into the harness. This feature is also a safety issue since, the pilots does not need to let the brakes go in order to get into the harness. 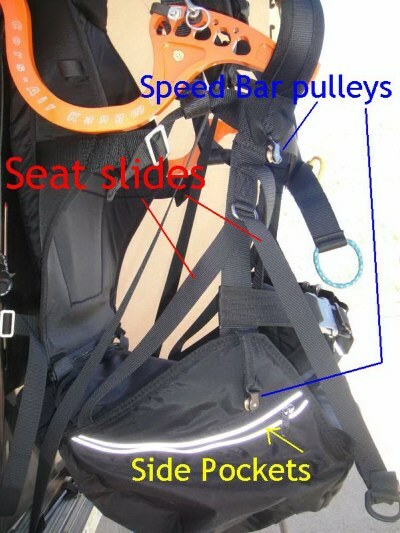 As seen above, on each side of the harness there are an upper and lower speed bar rope pulley. 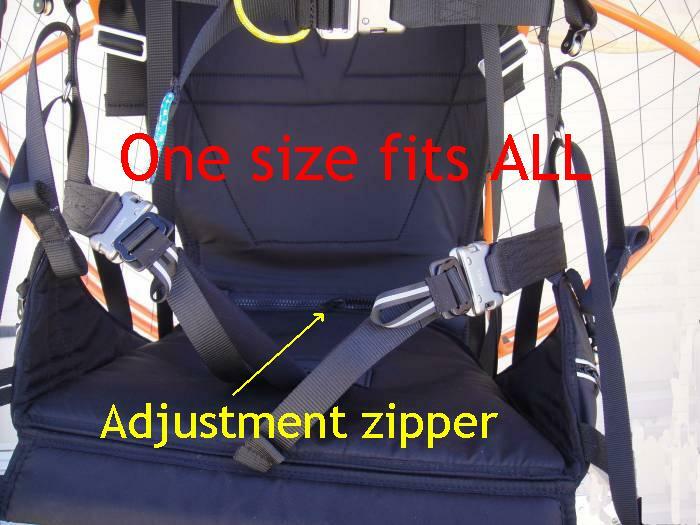 The new harness has two pockets on the sides and a large pocket under the seat where a wing stuff bag or flight suit can be easily stored. This harness is available only in the colors shown in this presentation. We have a large stock of this harness ready to be shipped to any customer.